Item # 316275 Stash Points: 2,500 (?) This is the number of points you get in The Zumiez Stash for purchasing this item. Stash points are redeemable for exclusive rewards only available to Zumiez Stash members. To redeem your points check out the rewards catalog on thestash.zumiez.com. Tear up every park or plaza feature in sight, with a set of Clone Mice 52mm 101a Skateboard Wheels. Coming in at 52mm in size, these wheels offer premium acceleration, while their 101a durometer rating creates controllable grip and clean power slides. Flat spot-resistant and made of a high-rebound urethane formula for a durable ride, these wheels will last for many sessions to come. 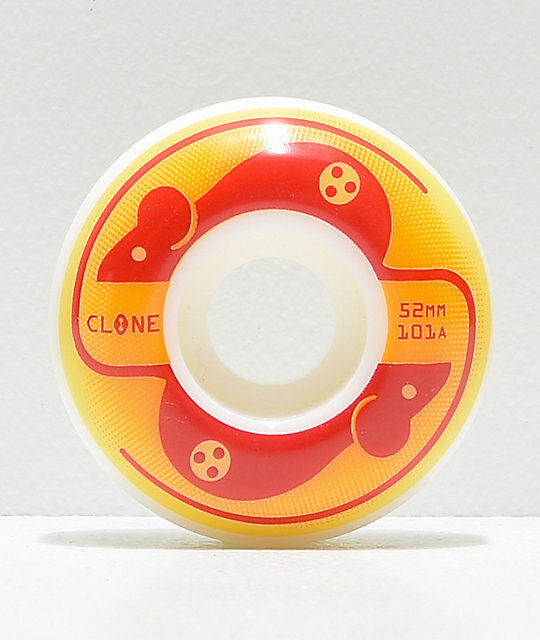 Mice 52mm 101a Skateboard Wheels from Clone Wheels. Black, pink, orange and white colorway with custom logo graphics.